Alejandro Moreno examines Barcelona's reliance on Lionel Messi after he scored his 50th career hat trick in a win at Sevilla. BARCELONA, Spain -- Ernesto Valverde called Dani Carvajal's response to the controversial penalty awarded to Real Madrid against Levante "fantastic" and played down suggestions Barcelona are worried about the number of VAR decisions going in Madrid's favour. Barca travel to Madrid for two Clasicos this week, the first in the Copa del Rey semifinal on Wednesday and the second in La Liga on Saturday. Both Catalan dailies -- Sport and Mundo Deportivo -- reported on Tuesday that the La Liga leaders have grown concerned about the number of debatable VAR calls dropping Madrid's way in recent weeks. One such decision saw Casemiro win what proved to be a match-winning penalty against Levante at the weekend. The Brazilian clearly exaggerated his fall, but VAR ruled there was enough contact for the spot kick to be awarded despite the theatrics. 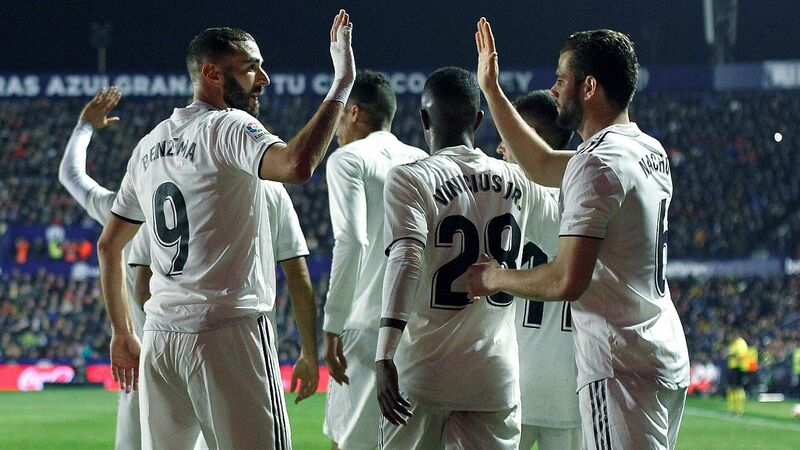 Speaking after the game, Carvajal claimed he could hear Levante's Cheick Doukoure -- who injured himself as a result of giving the foul away -- kick Casemiro from 25 metres away. "Don't tell me that Carvajal's response wasn't fantastic," Barca coach Valverde said in a news conference on Tuesday when asked about the right-back's comments and the decision to give the penalty. "I'm not going to say anything else about that, though. All I will say is that I hope Doukoure recovers as quickly as possible -- with no irony. "But we're absolutely not [worried about VAR going into the two Clasicos]. We're relaxed because we know controversy is always going to be linked to football and to other sports. We will try to win [the games] and forget about everything else." Wednesday's semifinal second leg at the Santiago Bernabeu will be Valverde's 100th game in charge of Barca. With the score locked at 1-1 from the first leg, the Blaugrana will have to score at least once to cancel out Madrid's away goal and progress. Real Madrid have had good fortune with VAR decisions in recent weeks. "I didn't know it was my 100th game but of course I would love to win it," Valverde added. "But it's a big game regardless of that because it's a semifinal and a Clasico. We know it will be tough, the score is not what we would have liked but the tie is open and everything is still to be decided. "We have to try and do damage to the opposition, as we always do, and go all out [to win] the game. Keeping in mind that if we don't score we can't go through, we're obliged to score. Obviously, we have to protect ourselves [at the back] as well, but we must attack the opposition." Arthur Melo and Jasper Cillessen both completed Tuesday's training session and could come into contention for the game. Samuel Umtiti is also available again after completing 90 minutes during Saturday's 4-2 win at Sevilla. The winners of the tie will play either Real Betis or Valencia in the final at the former's Benito Villamarin Stadium on May 25.